Thoughts on the new logo? Over the last few months Dan McElroy has sent me a couple emails about a Temptation Clone he brewed back in January. I was happy to lend him some advice, and very happy when he suggested that he would send me a bottle to try. 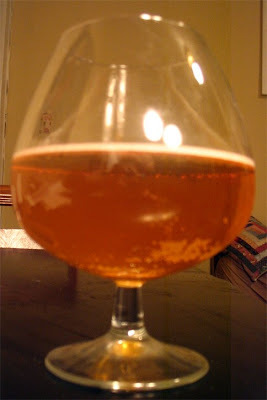 Appearance – Talk about a clear beer, nice orange/gold color. Head formation/retention is a bit weak, although that may be a result of my glass selection (I recently broke my Duvel tulip). Smell – Classic spicy Belgian aroma upfront, with a beautiful soft floral/honey component. The funk is very subdued, but I certainly get a hint of that cherry pie Brett. Taste – The spicy phenolics from the aroma carry through in the flavor as well. The funk is more upfront (with just a hint of barnyard), but it isn't really sour/tart. The malt and hops are very subdued, clean letting the yeast/bugs shine through. Mouthfeel – Medium-light carbonation, a bit lower than I would aim in a pale Belgian like this. More carbonation would also help the head retention. The body is what you'd expect, pretty thin but not unpleasantly so. I get just a hint of astringency, probably from the oak and dryness. Drinkability & Notes – A very nice attempt at a lightly funky Belgian Blonde, like my Temptation clone a tasty beer but very different from the original. It tastes very authentic (by which I mean understated and balanced), I especially like the yeast character. Drinking it on a dark/cold/wet December night I enjoy it, but this is the sort of beer that would be perfect for a warm spring afternoon. If anyone else out there wants an honest opinion on their beer (sour or otherwise) let me know. 1.00 oz. Sterling @ 60 min. 0.50 oz. Styrian Goldings @ 20 min. Pitched Wyeast Lactobacillus, Pediococcus, and Brettanomyces Bruxellensis all into secondary after 7 days fermentation with the white labs 550. Secondary lasted 7 months. The last month included about 1 oz Hungarian oak cubes - boiled and then soaked in chardonnay (paranoid about over-oaking this) Primary and secondary fermentation were at ambient basement temps which range from about 62 to 66 degrees. Note to self, try mashing at 154 next time, pull off primary after 5 days to leave more for the bugs. Not a strong sour profile, but there is some Brett there. I can't really find any chardonnay flavors or oak, so perhaps increase both for the next batch and/or skip the boiling of the cubes. Tastes more like an oro de calabaza from Jolly pumpkin, and very drinkable.